Body and few remaing parts in tray; Picture repeated from Reassembly-page 1; For this page 2's reference convenience. Screw alignment to original aged tilt is done by sequentil pilot holes into each pickguard hole previously reinforced with toothpick dowels. 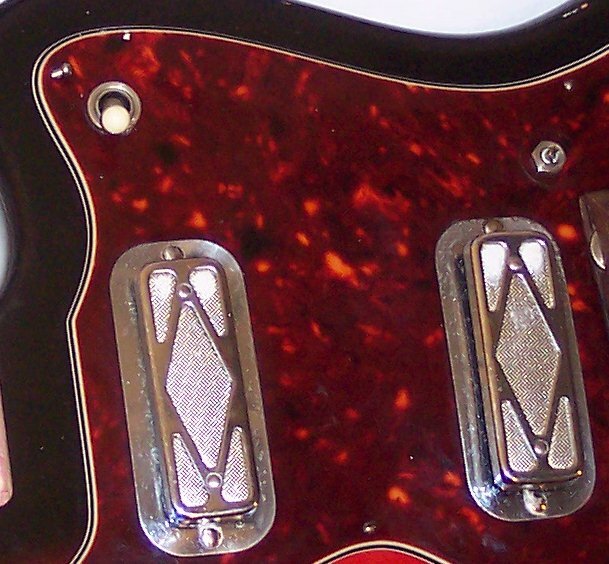 At the arrow the screw angle must be established before wax paper can be put under the pickguard to attempt the pickguard's chip repair. Excellent neck pocket is shown above and below. Front and rear strap buttons both cleaned up Excellent. 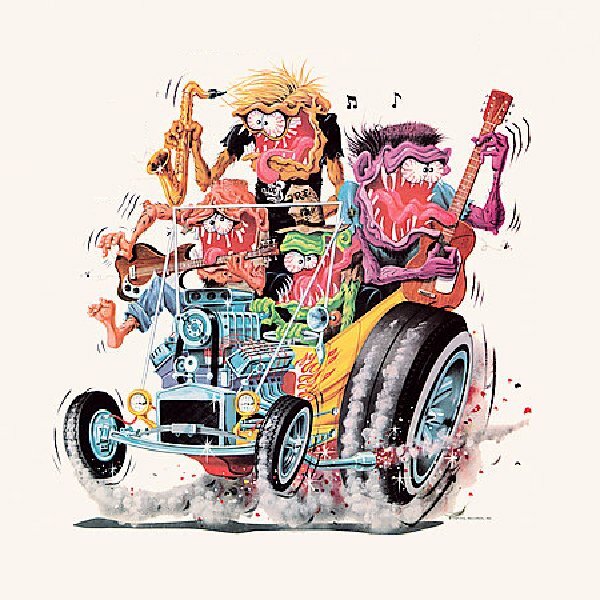 HOWEVER PLEASE NOTE that the original screws securing the strap buttons are really too small for the load of these guitars, and are known to fail. 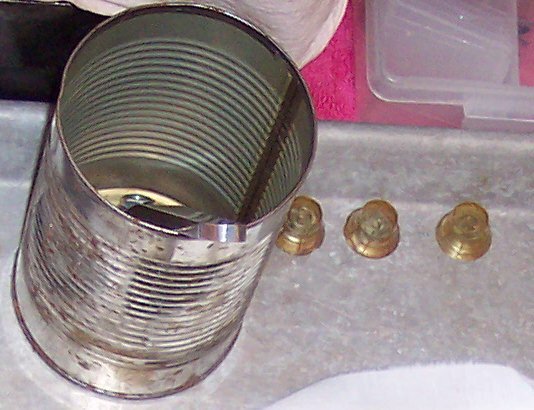 I would seriously consider installing larger more-standard size stainless steel screws, using the existing holes as pilot holes. Again, here is original aged screw tilt; Backed out here to show the tilt. 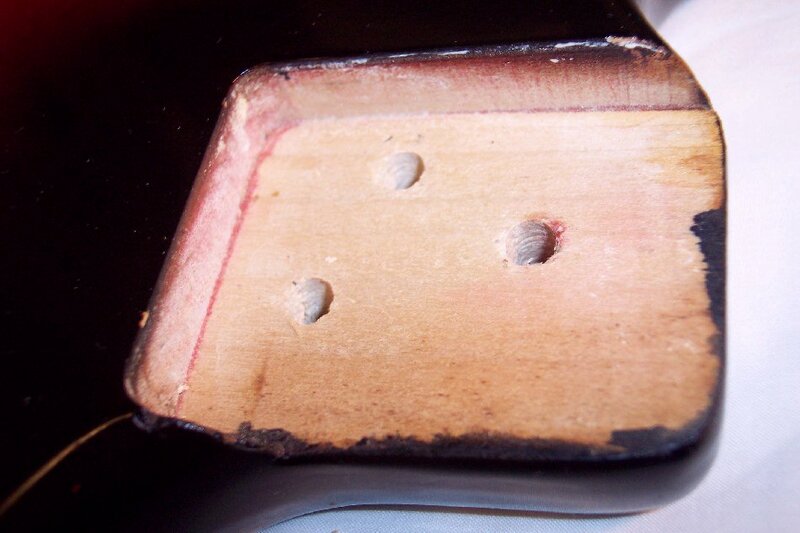 The expanded / tilted hole in the body wood was large and encroaching upon the edge of the cavity; So I reinforced the hole with toothpick dowels and glued them into place prior to tapping the pilot hole with a small finishing nail. The white on each treble bout side of each pickup is aluminum oxide oxidation between the VERY thin foil and top mylar laminate that makes up the foil covering under the pickup bezel. It is impossible to remove; However, the new 2-part chrome paints are excellent, .....and an auto body shop would be able to mix a little and carefully brush it onto these oxidized sections of the pickup if desired. 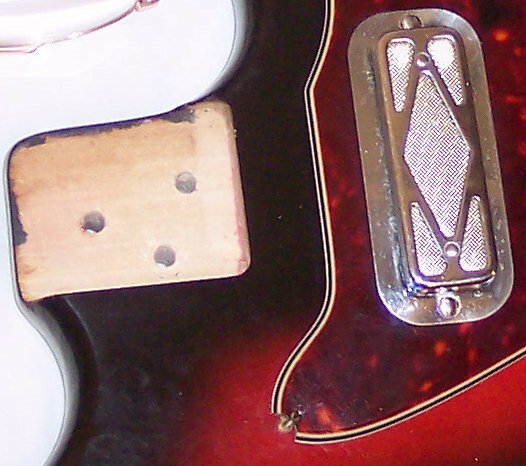 Personally I thin the oxidation is part of the guitar's "soul" and earned "blood, sweat and tears". The original bridge is on the left, simply laying close to where it would install (a bit farther back for proper intonation. However, the original bridge will need some filling of rough spots where it looks like someone trimmed the base plate down with a chain saw. 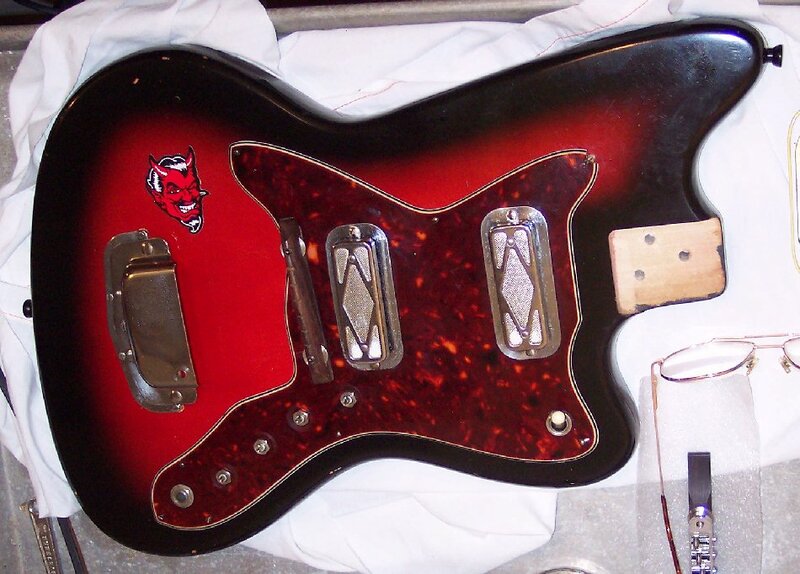 I feel sure the owner did this because he / she didn't understand how to use to tone controls to bump up the bridge pickup in the neck pickup favoring circuit logic with all controls turned all the way up. I will post a switching function and logc chart on these pages (electronics pages) when I finish those charts. I am trying to ensure that I can plane off the bottom of the archtop roller bridge on the right, and send it with the guitar as a much better playing bridge replacement. Preliminary comparisons indicate it should work just fine, but I won't know for sure until I can make measurements with a micrometer once the neck and strings are installed. Since the pickups are not height adjustable, then the adjustment for strings and pickup clearance is totally dependent upon the bridge height and neck angle adjustments / setup. The vibrato assembly cleaned up quite well for it's well used condition. The rear strap button cleaned up very nicely; But again, bigger screws for the strap buttons should be considered. They even have hole bigger than the original screws. Here is the vibrato arm "kept secure in it's parts can". Actually, I forgot to take it out for display when I took these pictures. I'm still looking / networking hard to find an extra knob to replace the missing one. The knob is the last part remaining to try to acquire. The tuners cleaned up quite nicely. The bent tuner went right back straight with no difficulty. Matching original ferrules were found to replace the 2 non-originals. 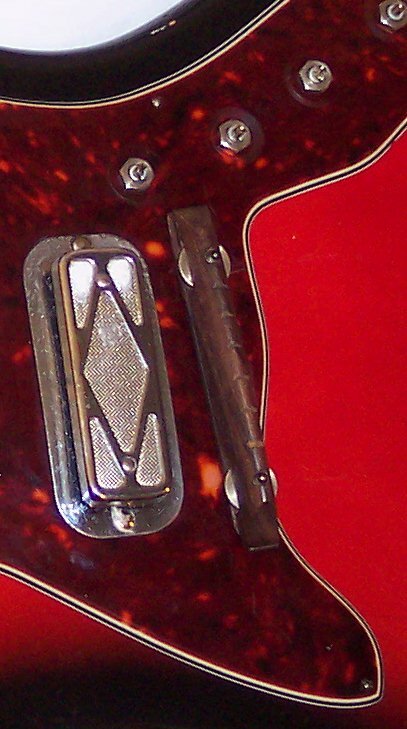 The wire running between the tuner holes and tensioned with the tuners, ....is a piece of guitar string put there to prevent the ferrules from accidently falling of the shafts where they are being stored / kept with the tuners. 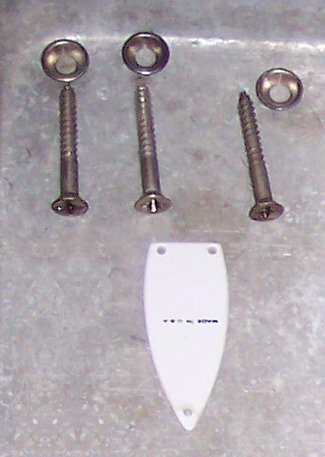 The 3 neck attachment screws and their counter-sink washer bushings; And the neck trussrod cover. Now what kind of fine Music do you think this guitar is gonna get itself into????? Yea....... I thought so ! 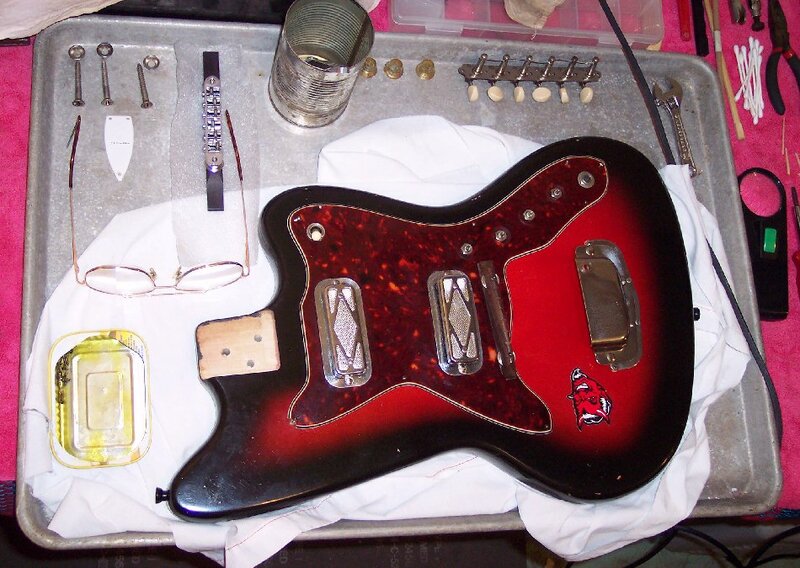 NOTICE: The pickguard / electronics assembly shown on this page was replaced with the better same-componants pickguard / electronics assembly from the donor guitar, ....as can be seen later as work progresses on these webpages. 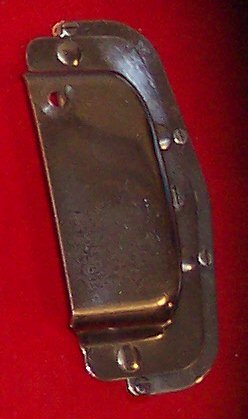 NOTICE: The intoneable roller bridge from the donor guitar was used instead of this replacement bridge, ....because the donor guitar's bridge was O.E.M. / original for a later year (1967) ST1478.